every living being, seeks pleasure. But we do not know how to seek pleasure perfectly. With a materialistic concept of life, we are frustrated at every step in satisfying our pleasure because we have no information regarding the real level on which to have real pleasure. We are not this body; we are consciousness. Not exactly consciousness, for consciousness is actually the symptom of our real identity: we are pure soul, now merged within this material body. Modern material science lays no stress on this; therefore the scientists are sometimes misled in their understanding of spirit soul. But spirit soul is a fact, which anyone can understand by the presence of consciousness. Any child can understand that consciousness is the symptom of the spirit soul. Krishna is the Vedic name for the Supreme Person, the source of our existence and the source of all pleasure. He’s known by different names in different cultures, but all genuine spiritual traditions agree that there’s only one Supreme God. Krishna consciousness is the natural, original, and blissful condition of every individual. Only when we’re covered by maya, illusion, do we forget who we are and who the Supreme Person is. We want happiness, but without Krishna consciousness, we don’t know who we are or what we’re supposed to do. We try to enjoy life through the body and mind, with hit-or-miss results. And we fear death since we don’t know what happens afterwards. The practices of Krishna consciousness, or bhakti-yoga, are meant to free us from the root cause of all anxiety by reawakening our normal, eternal spiritual happiness. The process is simple—meditation on the name, form, activities, and qualities of Krishna. Krishna is the Vedic name for the Supreme Person, the source of our existence and the source of all pleasure. He’s known by different names in different cultures, but all genuine spiritual traditions agree that there’s only one Supreme God. The goal of bhakti-yoga is to recover our natural sense of connectedness (yoga) with that one supreme God by serving Him with love (bhakti). 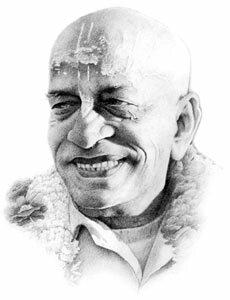 Practice of Krishna consciousness isn’t dependent on one’s personal belief. Anyone can experience the benefits of bhakti-yoga by applying Krishna conscious principles in their life.